Quite frankly the conditions outside are abominable. It is hot and normally that’s something I can deal with. However, the acrid stench of smoke and the dry burning feeling that starts to coat my throat when I breathe outside right now are not. So for a bit, I’ll be riding with a respirator. 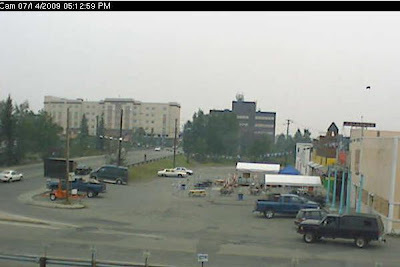 A dense smoke advisory has been issued and below a picture from the Arctic Web cam. The scene doesn’t look that bad, but please take note that you can’t see any of the buildings past the initial two across the river. Trust me; it is like visibility in a fog, only it hurts to breathe. All that being said I am feeling a bit lazy, so I'll leave you with a couple of quotes.